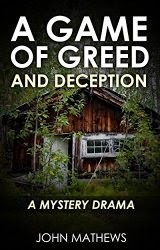 A Game of Greed and Deception is ok for a first novel.. it has a lot of potential. What I like about it: There's something new happening at every turn. What I didn't like about it: It was too descriptive that I found it difficult to follow what the author was trying to describe and stay with the story. Scenes just crop up without subtle introductions somewhere in the book. I like continuity especially in mystery thrillers, so the reader won't be surprised and feel like they missed something... like a few pages or a whole chapter? It's one of my pet peeves, not just in books, but in movies too. And there are questions that niggle at me.... Didn't she run out of cigarettes in the middle of the story? Did she find a fresh pack somewhere and it wasn't mentioned? Cause she was smoking again. Ahhh maybe I missed it. If you find the answer, do let me know. I give it 3 stars since it's a book that mystery readers would enjoy. But if you're used to reading Ludlum or Sheldon... maybe not.